During the semesters in China, me and my Japanese flatmate Yohei decided to go on a trip. We started with two days in Nanjing before we went back home and then went out on our long trip. We had seen on our TV once a program about the snow and ice festival in Harbin and we agreed quite soon that we should try to go there. We bought two one way tickets to Beijing, and went there. We actually hadn’t planned our trip very well. Yohei had seen in his japanese guide book that Chengde north of Beijing was one of the most recommended places in the book, so we went there. He was also very interested in the Sino-Japanese history (and for all Chinese readers I can tell that he was far from always a pro-Japan Japanese), so therefor we went further to Dalian, Lushunkou, Changchun, and finally Harbin. 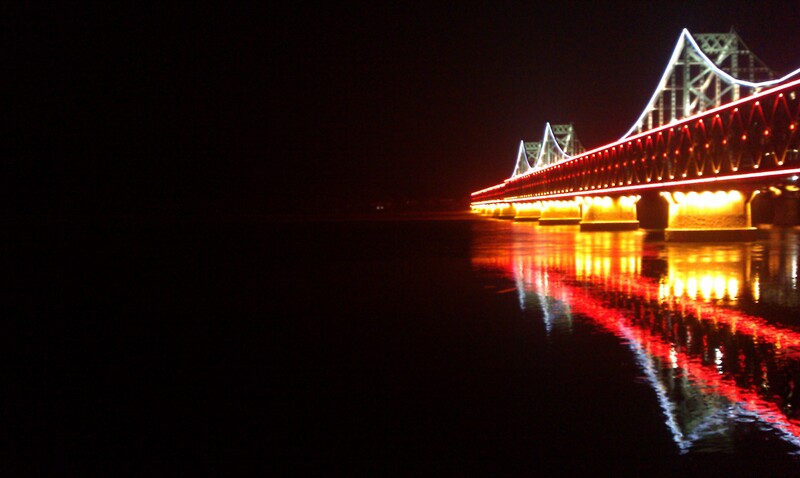 But there were one place that I had put on the wish-list: Dandong. Dandong is the city where the railroad passes the Chinese/North Korean border, and that puts its own touch on the city. 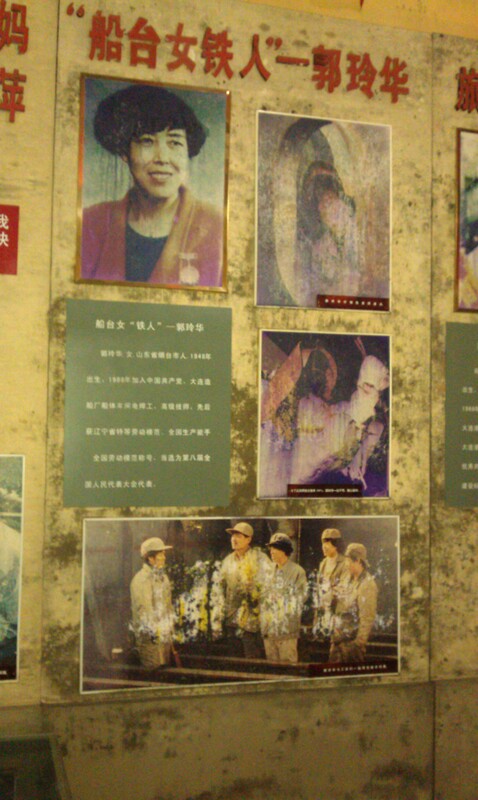 There is at least one big propaganda museum about the Chinese and North Korean friendship. Quite modern building. Outside it there is also a more old one, where most of the pictures had become moldy. I couldn’t read Chinese very well at the time, but I took a lot of photos in case I wanted to see it later. The feeling was that it probably will not be here if I ever come back. The propaganda were mostly based on the story the “voluntary troops” that “offered their lives for the brother people in Korea” during the war. Of couse I read about the war from a few other sources as well. All-in-all it gave a quite good feeling of the situation China has put itself in regarding North Korea. They are of course not satisfied with the North Korean game, but their legacy is also tightly linked to the legacy of the Chinese Communist Party. Info from the old propaganda musem. Mold. I find it quite tragic, that China has so hard to make up with the past, but as a wannabe-kind-of-responsible actor in the international community I guess the current situation make it necessary to move forward. China want stability, but that is not really the strategy from North Korea, rather the opposite, extreme rhetorics and unpredictability. I would not feel very safe if I lived closed to a country with nuclear weapons, but has no interest to see itself from an outside perspective. 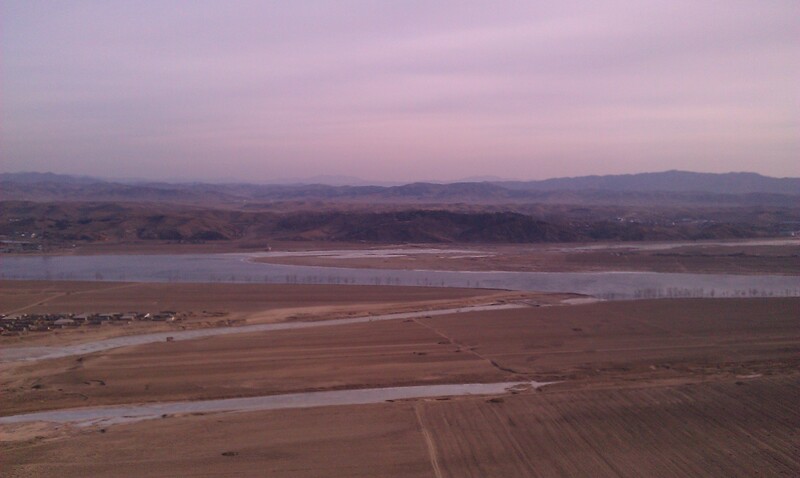 North Korea (taken from “Tigers Mountain” outside Dandong. North Korea is on the other side of the Yalu river. When I started my “the second blog”, that later was “found” by the Chinese authorities, I put that Sino-North Korean friendship bridge in the header. Just as a reminder that what we see in North Korea today, is not far from the Chinese Communist Party’s own legacy, and I think they should try to get some distance from it, and make progress. Not only in economics, but also to start to handle its own past in a more honest way. The bridge in Dandong between China and North Korea. Anyway. We were there a few days after the Chinese Spring Festival. We went to the bridge and the flood shore in the evening. We saw the bridge running out in nowhere. North Korea was completely dark in the night. We turned around and saw the kitschy Chinese facade lights and thought that China anyway must be seen as the paradise for people on the other side, living literally in the darkness. ← Det behövs mer kunskap om Kina.